NJ's TRUSTED Roofing Installer for over 13 years. 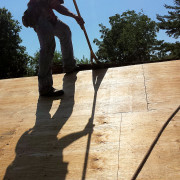 NJ's TRUSTED Commercial Roofer for over 13 Years! 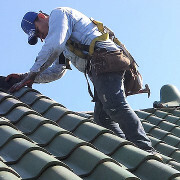 At H. Recinos Roofing, we've made it our mission to personalize our service to each individual customer's needs. We work with extensive types of roofing materials to complement the style of residential and commercial buildings alike. These options include asphalt shingles, fiberglass, wood, slate roofs, cedar shake, metal roofs, flat roofs and composition roofs. Our roofers are equally specialized in repairing, framing and installing all roof types and styles. Asphalt roof shingles are a reliable and economical roofing option. Even more, asphalt roof repair and maintenance is affordable. An asphalt shingle roof is extremely versatile in style as it can be built to mimic wood and stone. It is also available in an extensive range of color and thickness options. 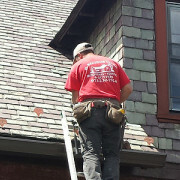 In fact, H. Recinos most popular New Jersey asphalt shingle installations are Timberline, Iko and Camelot. Slate roofing is aesthetically popular for its beauty and elegant charm. Though it can be more expensive than asphalt roofing, slate roof installation is exceptionally long-lasting and fire resistant. Like other options, it is versatile in color and thickness. Slate roof repair varies with the style and structure of the individual slate. Tile roofing is not only beautiful, but it is affordable and long lasting. 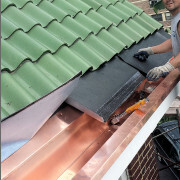 Although tile roofing is more expensive than traditional asphalt roofing, tile roof installation is exceptionally long-lasting and fire resistant. Plus, its natural beauty will enhance the your entire home or business. Tile roofing give the home owner an endless section of colors and design types. A cedar shake roof adds a natural, rustic touch to any property. Despite its drawbacks in the past, we offer chemical services to ensure fire retardancy and water protection in wooden roofs. As a result, you can enjoy the appeal of the surface without fearing the risks of natural wood. Flat roofing is an aesthetically modern and versatile option. With an array of material options, it's an ideal platform for homes with additional stories overlooking the roof's surface. Although flat roofs are more susceptible to ponding water, proper flat roof insulation can protect against leaks. 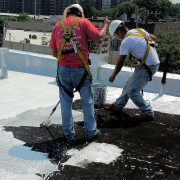 Flat roof installation and flat roof repair is generally more affordable than other kinds. Fiberglass roofing is an environmentally friendly type of asphalt shingle roof. Just the same, is offered in a variety of shapes and colors. While it is more fire resistant than typical asphalt, it is less durable is persistently cold temperatures. 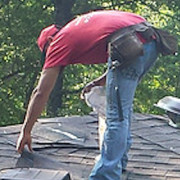 Fiberglass roof installation and fiberglass roof repair are also more affordable. Although it can be pricey, metal roofing is extremely durable and resistant. This will save you money on metal roof repair in the long-run. All metal roofing systems, from steel roofing to aluminum roofing, are low maintenance as well. With a variety of material options, your choice in metal roof installation can be tailored to capture the essence of your home. With an endless variety of roofing shingles and roofing tiles, you can choose the options to best suit your home or commercial property. Our experts will aid you in the decision making process or simply follow your lead. With an endless variety of roofing shingles and roofing tiles, you can choose the options to best suit your home or commercial property. Our experts will aid you in the decision making process or simply follow your lead. Call H. Recinos Roofing today at 973-230-7924 for reliable service at an affordable price and you will discover H. Recinos has your covered!